The Spacedec Counter Mount Multi VBM is designed for commercial and retail applications. 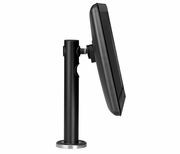 It features adjustable tension control for touch screen operation and is perfect for point of sale use kiosk use. With its compact design, contemporary styling and advanced security it suits installation in front office and public area environments. The Counter Mount features a Quick Release mounting head for easy display installation and fast maintenance. The screen can be locked with a security screw and the mount supports use of 3rd party cable locking devices. Hidden mounting screws and integrated cable management further enhance theft resistance while also improving the visual presentation. The pole allows horizontal screen rotation to suit situations where information needs to be shared. For situations where confidentiality needs to be maintained rotation can be locked during installation or limited within a series of ranges. The mounting head incorporates a ball joint with tension control for universal tilt/ pan and landscape to portrait screen orientation adjustment. Maximum screen height when measured from the center of the screen: 13"